I took a Sunday drive except it was a Tuesday this week. My good friend, Marti and I drove, well she drove, I rode a little over 100 miles (actually it was more than that because as we were driving and doing way too much talking we missed the turn, so add an extra 13 + miles) to Lake Carroll, IL to visit a friend of Marti's that had moved there 20 years ago. They have kept in contact, which I think is exceptional to stay in contact with those that have moved away....Marti is a master at this....she has friends from childhood, friends from high school, friends from college, neighbors or church members that have moved away that she keeps in touch with which I think is a unique quality. I can barely remember my high school and college friends, let alone stay in touch with them. It is kinda sad not knowing how some of my best friends in high school lives unfolded. Did they have happy marriages, how many or any children did they have, are they even still alive? Oh I do diverse....back to Lake Carroll. Helen and her husband Lyle have a lovely home buried in a wooded area and after a tour of the house and lunch at the clubhouse, Helen took us on a drive through the countryside. Just a teeny bit of history abut this part of Illinois....very hilly so unlike the Chicago area which is flat as a pancake, but the reason we are so flat and this area which is in the the northwest area of Illinois, fairly close to Iowa & Wisconsin is so hilly is way way back when we were in the middle of an Ice Age, the glaciers made it down to the Chicagoland area, but didn't make it as far as northwest Illinois, and when they melted, they left the land flat. I didn't know that but everyone I mention it to had heard that.....I really think it was because they were raised here and probably learned this in school, while I went to school in Texas and learned about the Alamo and not glaciers. Marti had mentioned to Helen that I love finding barns to photograph. It was an absolutely gorgeous day, sun was shining, slight breezes, blue skies with the most beautiful puffy clouds....give me a red barn, blue skies and puffy clouds and I am indeed in heaven. And with two wonderful women by my side, indeed a lovely day. I love this "condo" style barn with all of its windows...altho I wonder if those shutters open or are just decor. We did run across a couple of quilt barns....wish I could tell you the name of those squares, but I honestly don't have a clue. I could google it but there are problem close to a gazillion different ones. And we ended our drive with this church. 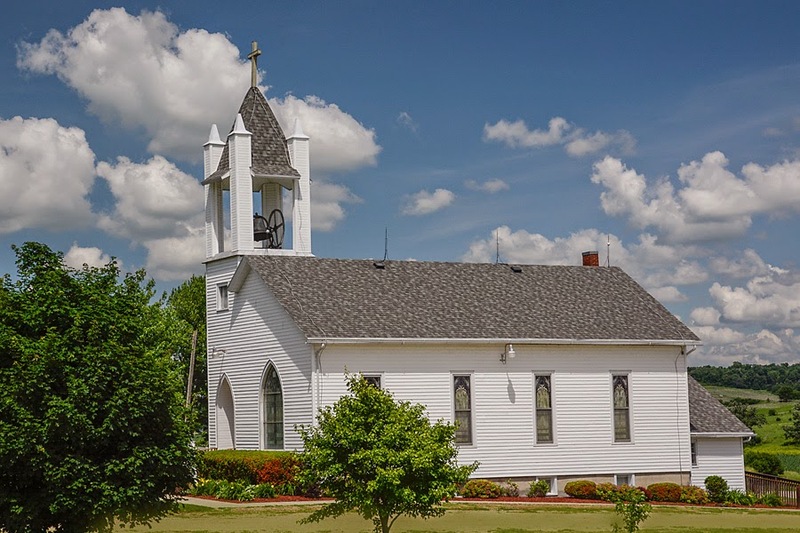 Isn't this just the perfect setting and site of a country church. But my post isn't complete without a fence...to link up to TexWiseGirl's Good Fences. 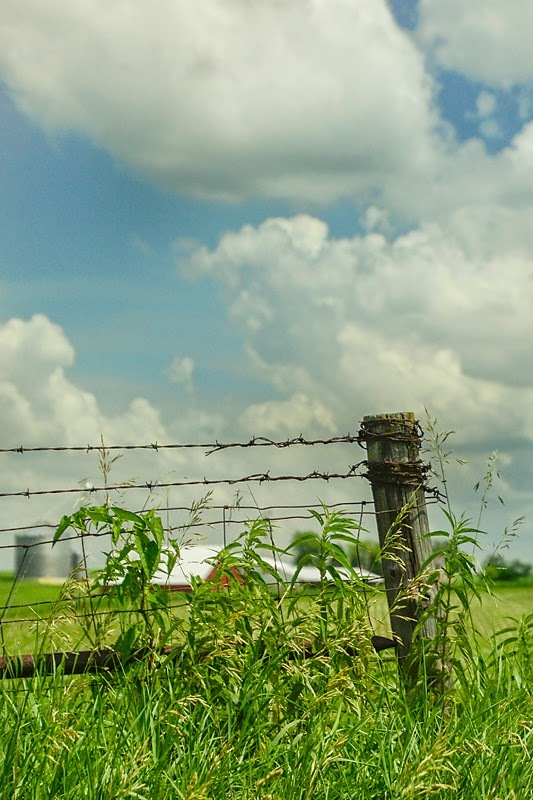 This is very typical of the fences in this part of Illinois, nothing fancy, but gets the job done. And today is the day I post at my collaborative blog Focusing On Life. Please take a moment to stop by. I've missed you - but am happy you are enjoying the countryside of Illinois. Speaking of which - how is the weekend of the 25th of July looking for you??? LOVE THOSE ILLINOIS BARNS, and what a fun Tuesday , sunday drive. I do remember those sunday drives with my family. Any fun photography classes planned?? I need somehthing exciting to look forward to . Got the blahs! loved your farmland views! brought be back to my midwestern roots in a heartbeat. :) although, we never had any of those fancy windowed barns! wow! thanks for linking! great post! Oh so beautiful! It sounds and looks like a wonderful day! Wow - what a gorgeous part of America!! Those barns are gorgeous! 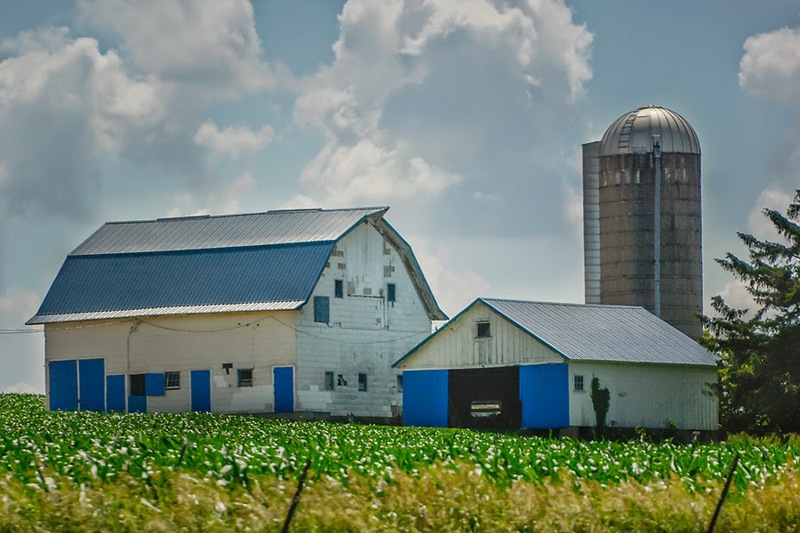 I've never seen a blue barn either. You've captured a nice variety. Hi Deanna, Glad to see you're out there enjoying friendship and summer. I saw your past flower post - love that unusual colored Columbine. Finally, my garden is showing green - not many blooms yet - it's really late this year. Nice pics. Love the way barn design vary by region. If you know the county you were in you might google it + quilt trail. I've found some from counties around here. What beautiful barns, Deanna, and it sounds like you had such a wonderful day. 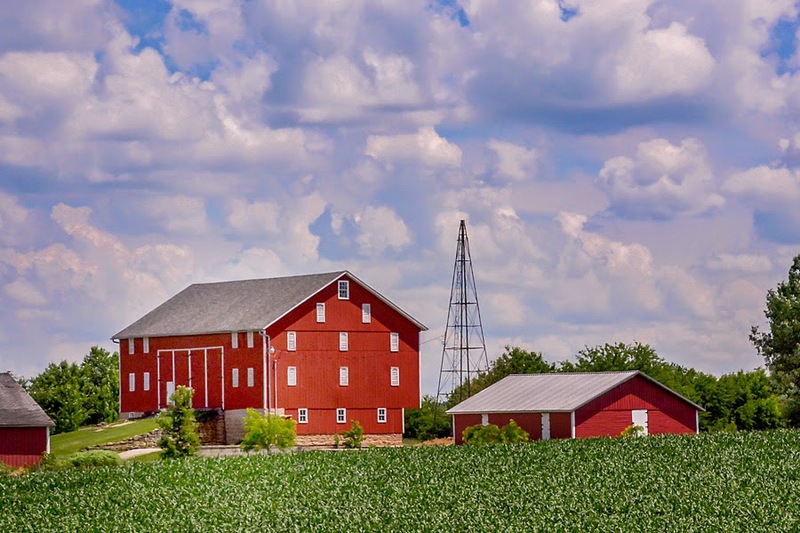 Beautiful collection of barns and a great fence image! Exceptional . . . I really love your photos . . .
You have outdone yourself on these - especially that first one. Wow! Always enjoy checking in on your posts Deanna...sounds like a great outing for the girls and wether perfect too. 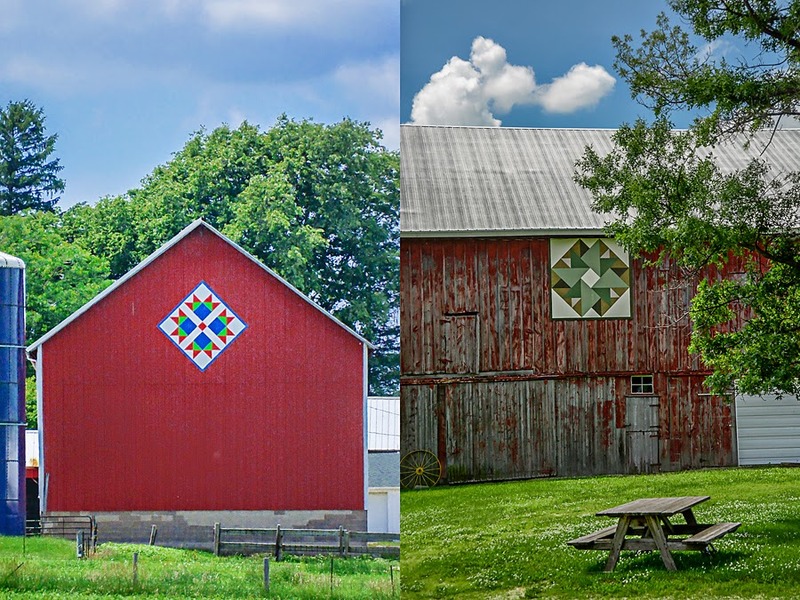 Does the painted quilt on barns go back to the Amish? Wonderful drive through the country and I love that little church. It would be a great place for a small wedding. What a wonderful drive you had and those barns were great. 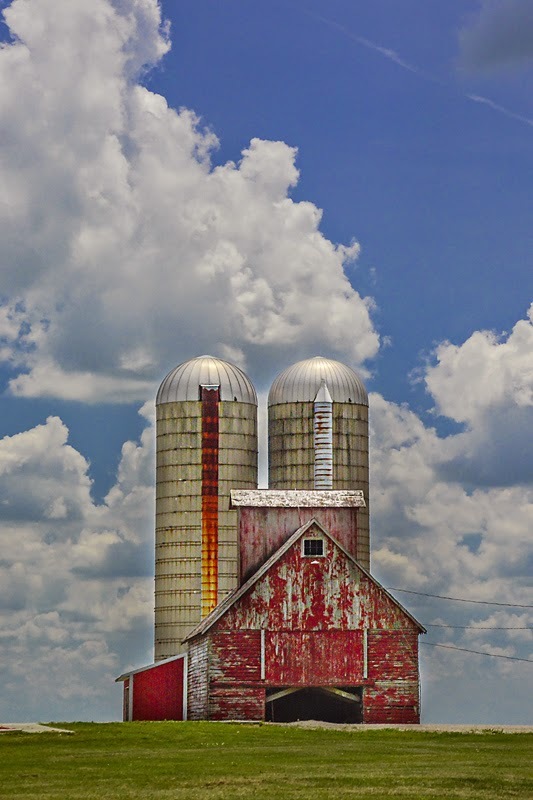 I really liked the 1st shot of the barn and the twin silo's. Also your fence shot with the barbed wire. I'm thinking the Quilt barns are related to Amish barns where they use "Hex Signs" on their barns. I'm doing a Google search on both to find out. Nice ride! We have many barns up here with the barn art...very fun, in fact I think there is a driving guide to see them. I could ride in a car all day, especially in the company of other photographers! Beautiful photos. I love all the barns art! I am in total love with these photos. So happy to see you taking advantage of good weather to get out and around with your trusty camera and swell new lens! It's doing nice work for you, love your photos and always, your barns. I think the first barn pattern is turkey tracks but I'm not positive. They are not Amish related. The quilt barn phenomenon began with a daughter who wanted to honor her mother who was a quilter. The mother is from WV and my home county. Howdy girl! Are you out there? Hope all is great and that you have a lovely holiday weekend! Hi Deanna! I'm with you--sounds like Marti has a real gift keeping up with all those friends. Sounds like you had a perfect day, and you certainly came back with some gorgeous photos. OH Deanna these are fabulous and those barns wow wee. Love the little church and that fence post is great.